In an era in which Fat Freddy's Drop and Red Hot Chili Peppers are considered heritage artists and humans are no longer boxed by sexuality, one might describe Strangely Arousing as "trans genre" and comfortably so. Their reggae-based, jazz-influenced sound has led them to play for a wide range of audiences. From Raggamuffun through Rhythm and Vines to Tora Bombora. Setting the vibes in motion will be local lads, One Waka. A 7-piece Reggae Roots Cooperative bringing their take on rockers rhythms, up skanked tempos and harmonic vibes. Inspired by the authentic roots sounds of the 60s & 70s and iconic kiwi reggae & dub greats like The Black Seeds & Katchafire, One Waka have set out to bring those vibes to the live audiences of Christchurch, New Zealand for the past six years. 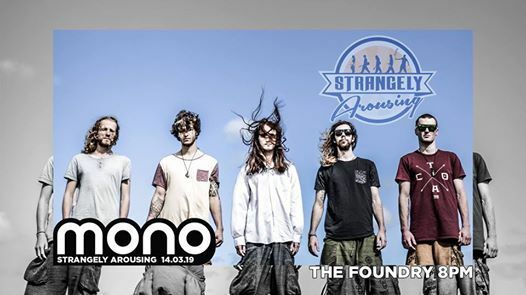 - Mono is R18 - Bring your Passport, 18+ card or NZ Drivers licence. - Don't forget your UC Student ID! - Not a UC student? Then you better find a mate who is! You wont get in otherwise. You're their plus one. Note: It's plus one not plus five! - Not a UC students plus one? Sorry team, this ones not for you.